Monsoon season has descended on Atlanta, and for the last couple of weeks an endless barrage of rain storms has moved through the area. The sun seems to have forsaken us. I’m a spring kind of guy, and this time of year I crave those 70-degree days filled with sunshine, daffodils, and azaleas. So far this year my weather cravings are somewhat unfulfilled. This week’s forecast tells me sun in on the way, but because it’s stormy and gray today, I need a little pick-me-up that reminds me of spring. How about a Banana Cream Pie to celebrate the return of the sun? I say yes! I’m not sure why Southerners love their bananas, but they do. Banana Cream Pie and its cousin, Banana Pudding, epitomize Southern sweets. My version of this pie includes a traditional pie crust and whipped cream topping. Variants of this dessert employ a graham cracker crust and a meringue topping. In my opinion, though, this pie screams for whipped cream. Several months ago I posted a Blackberry Galette. I combined whipping cream with mascarpone, creating a more substantial topping for the galette. I’ve recycled this idea for the pie’s topping with great success. For a little extra dressing, I garnished the pie with toasted macadamia nuts and shaved chocolate. Celebrate spring with this decadently delicious treat! 2. Mix flour, salt, and sugar in a small bowl and place in the freezer for 15 minutes. 6. Place dough on a floured surface and roll out to a 14-inch round. Transfer to a 9-inch pie plate. Trim excess dough and crimp edges. Place pie plate in refrigerator for 30 minutes. 7. Preheat oven to 375 degrees. Using a fork, prick the bottom surface of the crust several times. Line the dough with parchment paper and fill with dried beans or pie weights. Bake crust for 15 to 20 minutes, until lightly browning. Remove parchment paper and beans and continue cooking for 10 to 15 minutes or until golden brown. Remove from oven and cool completely. 1. In a medium bowl, whisk eggs and egg yolks. Add corn starch, milk and cream and whisk until cornstarch is incorporated. 2. Transfer cream and egg mixture to a medium sauce pan. Add sugar, salt, and vanilla to pan and place on cooktop over medium heat. Whisk to incorporate sugar. Continue to whisk regularly while mixture heats. Cook for 10 to 12 minutes or until pudding thickens and coats the back of a spoon. 3. Remove from heat and cool for 10 to 15 minutes. Return mixture to bowl and cover with plastic wrap, pressing wrap to surface of pudding. Refrigerate for 3 to 4 hours. 1. Transfer cream, mascarpone, vanilla extract, and confectioners sugar to the bowl of an electric mixer. Whip mixture until stiff peaks form. 2. To assemble pie, spread 1 cup of vanilla pudding over pie crust with a large spoon. Layer 1/3 of banana slices over pudding. Repeat another layer with 1 cup of pudding and 1/3 of bananas. Add a third layer of pudding and bananas and finish with 1 cup of pudding. Cover pie with plastic wrap and refrigerate for 2 hours. 3. Spread or pipe mascarpone cream on top of pie and garnish with macadamia nuts and shaved chocolate. I hope Bobby doesn’t look over my shoulder right now. If he did, he be wanting me to make this for him tonight. 🙂 This is he absolutely most favorite pie and what a beautiful pie this is. Simply gorgeous! I say yes to the idea of Banana Cream Pie too! We just had a smattering of snow this morning. Not okay! I am so with you that I need spring. 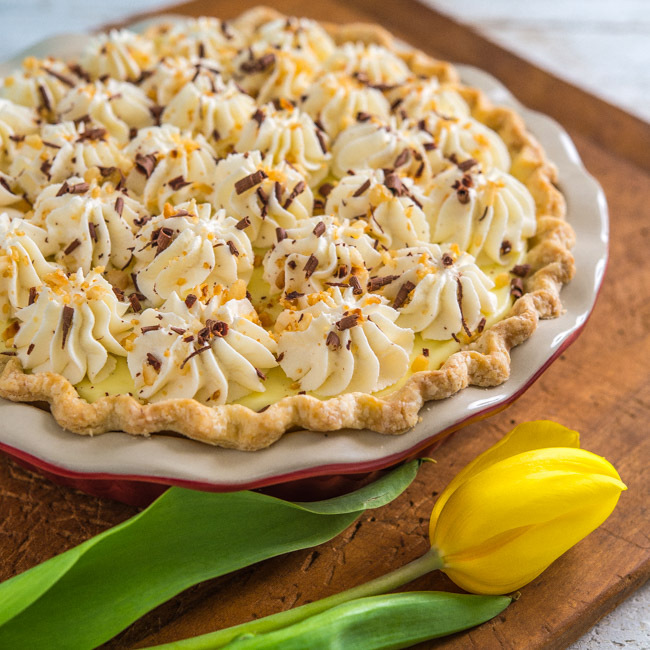 This pie is an inspiration and I love the tulips. Beautiful! I am obsessed with banana cream pie! But funny enough I have never made it at home! Yours is stunning! Love the twist of using mascarpone. That way, the pie is more creamy and rich! Awesome!